Home / Teaching and Learning / Scholarship of Teaching and Learning: Putting Teaching Improvement to Work! The CFE already offers small grants to pay for data analysis support, to partially compensate instructor time working on SoTL publications, or to help pay for conference registration and travel where an instructor is presenting a SoTL poster or paper. Whether you are new to the scholarship of teaching and learning or a long-time practitioner, we hope you will take advantage of the SoTL support resources throughout the academic year. 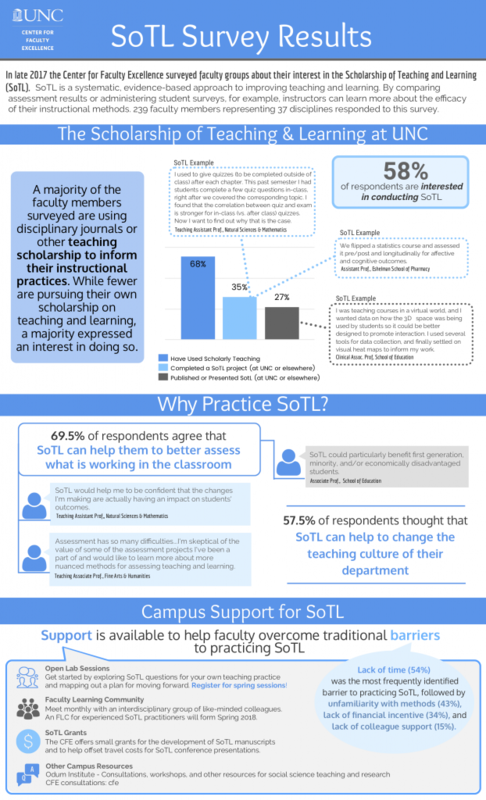 What Comprises a SoTL Project? We are available to talk to faculty members about any aspect of their teaching scholarship interests. Contact Bob Henshaw at bhenshaw@email.unc.edu to schedule a time to meet. Use the links provided to get started navigating SoTL literature. Use the links provided to get started with your SoTL Project. Click here to read the article that many people credit with initiating the modern SoTL movement. Click here for a non-refereed but informative essay on the conceptualization of SoTL. Click here to watch a Youtube video of SoTL scholars making specific recommendations for SoTL readings. 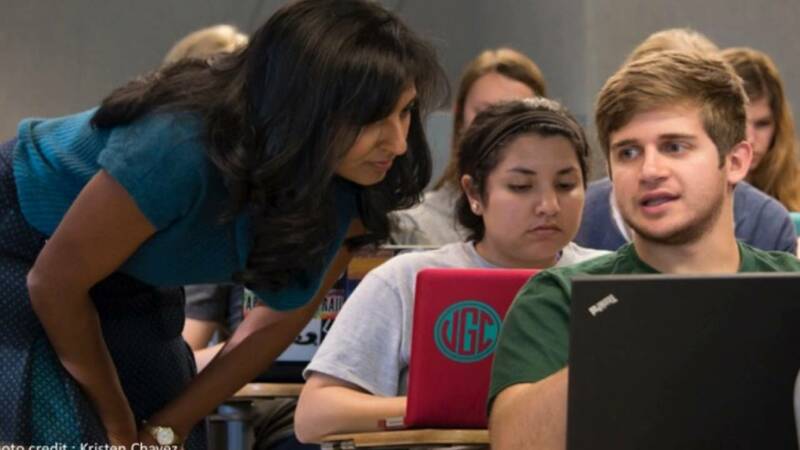 Finally, click here to visit Vanderbilt University’s in-depth catalogue of free SoTL support guides. Balaban, R., Gilleskie, D.B & Uyen Tran (2016). 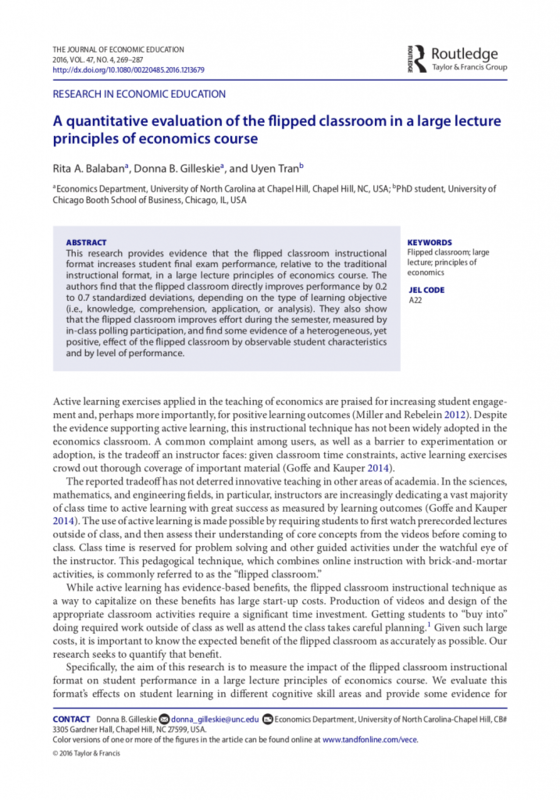 A quantitative evaluation of the flipped classroom in a large lecture principles of economics course. The Journal of Economic Education, 47:4, 269-287. Buzinski, S. G., Cohen, M., Day, A., & Armstrong-Carter, E. L. (2018, March). 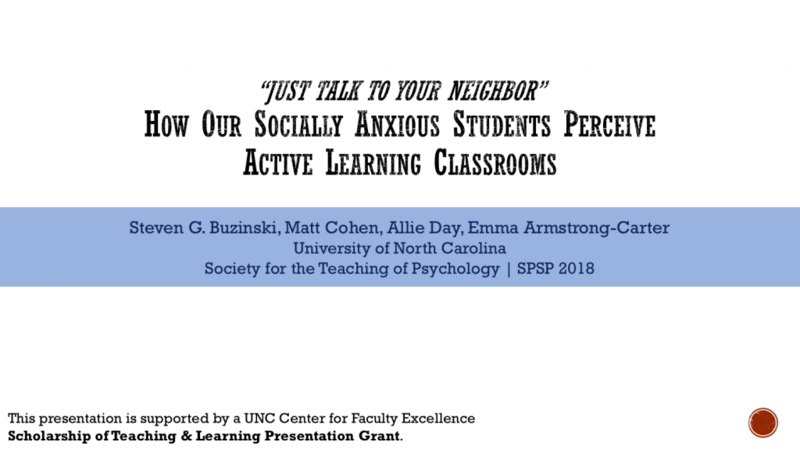 “Just talk to your neighbor”: How our socially anxious students perceive active learning classrooms. Presented to the Society for the Teaching of Psychology Preconference at the Society for Personality and Social Psychology (SPSP) Conference, Atlanta, GA.
DeFays, H. and Henshaw, B. (2013). 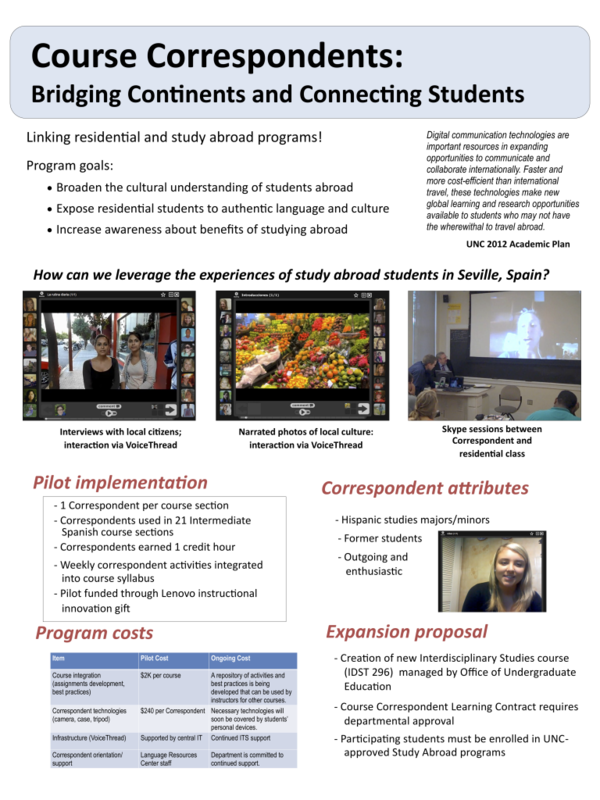 Course Correspondents: Bridging continents and connecting students. Presented at EDUCAUSE Learning Initiative Annual Meeting, Denver, CO.